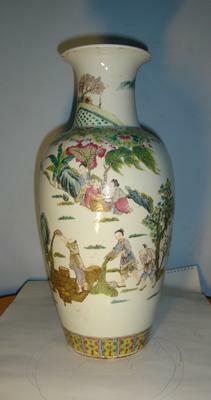 My family owned some of Chinese antique porcelain from generations. My grandmother used to own an antique store during 1930s-1950 and this is one of her collections that was left to my parents. I do not know much about this, would appreciate if any reader could provide comments. Thank you in advance. I do apologize as some of photos was taken by my uncle and show dust at the bottom of the vase. It was kept in storage for a long time. Unfortunately, the blog here limits picture size. If you have larger pictures, it would be of advantage if you could upload them to an image site like Photobucket (or any other website), and then post the link to the pictures in the blog. Thank you for your quick response. 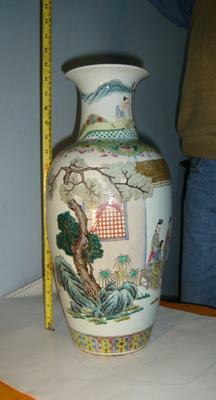 I forgot to attach one more photo showing the bottom of the vase with Chinese letter showing when the vase were made. I have these photos attached in higher resolution but I had to re-size them when attached, as the files were to big and they did not accept them. 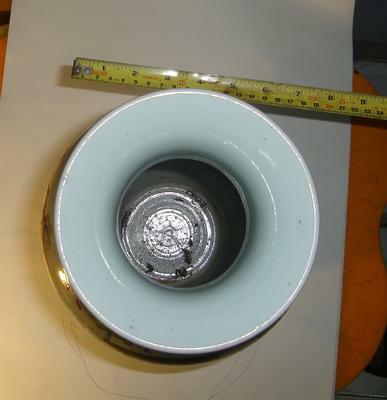 From these big file they show a clear picture of all angle of the vase. Do you have any other email address that I can send to. As I knew from my Dad, this vase is in perfect condition, no chip no crack, and was one of my grandmother's treasure. I would need more pictures, close-ups of the people and the bottom, with good resolution, if possible. Blemishes should be visible,if there are any.